Béla Czóbel (1883-1976) is the first painter who was provided with an independent museum in his lifetime, at age 92, in a one storey building on the castle hill of Szentendre. The building was originally a Catholic boy school. The art of István Ilosvai Varga (Kunhegyes, 1895 - Budapest, 1978) is often considered by critics out of time even though in 1942 Aurél Kárpáti and Ernő Kállai regarded the artist then in his fortieth as one of the significant representatives of new Hungarian painting art. Ilosvai Varga really did experiment with a few compositions out of time when for example returning from Paris he was interested in seeing if the landscape around Kunhegyes could take on Van Gogh's weavey and soft touch of brush. In his early compositions in Szentendre he tried various ways of editing before he found his own voice. He was also thinking in terms of activist formations when he experimented with painting every day scenes in wide hoop-like contours. The exhibition reviews all the artistic eras of the painter artist. His early works from Kiskunhegyes are good examples of the atmosphere of the place where he was born, his Great Plane roots that affected his art in terms of colours and memories of colours. The significance of these paintings is heightened as Ilosvai Varga did not only win the public of Kunhegyes over with these paintings, but also that of Budapest. His interest in Nagybánya was a natural recoil of his decision to become a painter. He spent the summers of 1929 and 1931 in Nagybánya. Maybe the sentence that whatever he was looking for in Nagybánya he found in Szentendre is the truer for Ilosvai Varga of all artists. Géza Vörös, who he spent the summers in Nagybánya with, recommended a visit to Szentendre to Ilosvai. Later the town became his second home. He purchased a house in the town in 1935 and moved in for good. In 1937 he was chosen honorary member of Szentendre Painters' Society, though he resigned a year later. Nevertheless he returned to the society in 1945, though this time as a regular member. When paintings the first pictures in Szentendre, he applied cheerful colours he brought with him from Nagybánya. These were landscapes with wide horizon at the beginning (View at the Danube), but slowly he turned to painting human figures (Szentendre with large trees) . With time the colours became darker and the wide horizon also disappeared. Compositions with human figures, large straight willows, lanes and alleyways made the scene for the human beings in the pictures (Gate Tinker, Street with Horse carriage, House with Men with Crutches) . The brown tone represent the view of the town but also the workmen, his compassion and sympathy (Poor Man, Beggars) . From the thirtieth he began using lively colours gradually. The dark tones he used in the decades before dissolved (Old Munkácsy Street, Deal, Greyish Walls). He often chose just one colour to make it he basic tone of his pictures (Blue Colours, Black Picture, Purple Picture, Pink Picture). In the fiftieth he painted street in traditional perspective to make them still-lives. From the sixtieth not only did the colours become even more vivid, but he chose brave methods of construction to balance space (Green Gate). The past year he painted was in 1972. The House and Men commemorate the last year of his career. 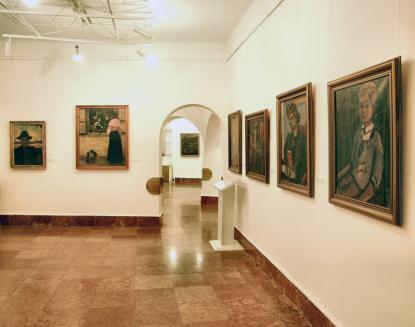 Several works of art unearthed from the depths of the warehouse that has not been featured in any permanent exhibitions are featured in the exhibition opening on February 5, 2016, entitled 'Czóbel Rethought' in Szentendre, where visitors can see behind some of the museum's masterpieces. Some now revealed pictures were on the back of other works repainted, covering, hiding dormant.